In order to learn techniques, a character must undergo the required training to master them. This training is regulated by a system based on word counts, which increase in amount with each successive rank. A player may type these words out (in the form of actual practice of a technique in any given post), or may pay CP (see the Character Points system for details on earning CP) in their place. CP may be spent to purchase techniques at a rate of 1 CP for every 25 words that would otherwise be required. This expenditure does not count towards a character's ACP. Players may choose the method by which their character will learn a technique (though, when learning from others, the development that a character will undergo in order to learn a technique will be more nuanced); whether by trial-and-error or by a careful planning of the character's chakra control, nature, and shape transformation for the of the technique, as long a character meets the required word count and has the essence of training in their post, then the character can learn the technique. Whenever a character trains a technique, that character's player must use the Character Update board (and the Update and Requests Templates) to submit the training for approval. Note: If you are either a genin or a chūnin, you are eligible for instruction in the training of techniques by a sensei of jōnin or higher rank. This method of training halves the word count (or CP cost) required to train a technique. The ability to learn, train, and teach techniques of various rank is associated not only with a character's experience, but also with the training that they have received that is associated with the tasks of leadership. Characters begin with techniques of each Skill that they possess, as well as those of Skills that they do not possess that their Origin would allow them to train, up to their rank of registration. For genin, this is all D-Rank techniques and below; for chūnin, all C-Rank techniques and below; for tokubetsu jōnin, all C-rank techniques and below, as well as all B-rank and below for their designated Skill of expertise; for jōnin, all B-Rank techniques and below; for ANBU, all A-Rank techniques and below; for Kage, all S-Rank techniques and below. Genin, as a result their lack of experience and shallow degree of training, are unable to learn A-Rank and S-Rank techniques unaided without meeting certain conditions. Genin cannot learn A-Rank techniques unless they are taught by another character (a mentor of some sort; usually a sensei or another high-ranking shinobi of their village), possess at least Proficient Wisdom, or possess at least 5,000 TCP. Neither genin nor chūnin are able to learn S-Rank techniques without a mentor, at least Masterful Wisdom, or at least 7,000 TCP. These conditions are also delineated under the Wisdom guidelines near the bottom of the Attributes page and under the Class section near the bottom of this page. Note again that, in addition to proper character rank (or mitigating Wisdom or TCP), a character must possess at least the Novice rank in any Major Skills to create custom techniques of up to B-Rank, at least the Adept rank in any Major or Minor Skills for which they would like to create custom techniques of up to A-Rank, and at least the Expert rank in any Major or Minor Skills for which they would like to create custom techniques of up to S-Rank. A number of techniques either received no rank in canon, or were ranked according to factors that are not taken into consideration (or at least taken under different consideration) on the site. In these circumstances, Staff have assigned or re-assigned ranks to these techniques, and have listed them below. Additionally, several techniques were assigned prerequisite conditions. In these circumstances, Staff have noted their given (or re-assigned) rank, and the prerequisite conditions in parentheses next to their ranks. Note that while techniques that require a certain rank in a Skill or that require an element will be noted, parent techniques will not (despite still being prerequisite to learning the technique). The techniques listed below (if and when they are listed properly, which they are not necessarily) are listed only for temporary reference. Eventually, all bloodline and Hiden techniques will migrate onto an appropriate clan's registration on the Bloodline Registration board. [*] Lava Release Armor: - B-Rank. Requires D-Rank chakra per post to keep active. Last edited by Zei Houjin on Sun Jul 02, 2017 2:33 pm, edited 2 times in total. Below are the general guidelines for trying to balance the various increases a technique may end up giving to a character's stat based on its rank. These increases to stats are generally referred to as "boosts". Boosting a stat via technique has its limits, with higher ranked techniques obviously having stronger effects. All canon boosters are balanced with these guidelines in mind, so keep them in mind when designing custom boosters as well. That isn't to say that a technique can't deviate, given other balancing factors, but in general, this guideline should be a help. Upon reaching certain tiers in a stat using a booster, boosts begin to reduce in effectiveness, representing the minimal amount of improvement a lower ranked technique can have on already impressive stats. The tier in which this occurs is determined by the rank of technique (note that it applies from the start of that tier forward, including for a technique that boosted to that tier (though it will not reduce the boost below that tier). It does not apply to other techniques stacked below it). At that tier, each individual boost provided by that technique is reduced by the corresponding number advantages listed below, also determined by the technique’s rank. A boost can be reduced to 0, but cannot be reduced below 0 (exceptions including Styles such as Goken and Arhat which will always give at least a Minor Advantage). At Masterful, each boost given by a D or C-Rank is reduced by 1 advantage. At Epic, B boosts are reduced by 1, C and D reduced by 2 (if any). At Legendary, A boosts are reduced by 1, B reduced by 2, C and D reduced by 3 (if any). At Godlike, A boosts are reduced by 2, B reduced by 3, C and D reduced by 4 (if any). Remember that stats cap at Godlike w/ a Major Advantage anyway. Example: A character has boosted to Proficient w/ a Major Advantage in Strength and Reflex with the C-Rank Strong Fist. They then use the C-Rank Leaf Great Whirlwind which grants +2 advantages in Reflex and +1 advantage in Strength. Strength improves to Masterful. Reflex would improve to Masterful w/ a Minor Advantage, but as a C-Rank, its boosts are reduced by 1 advantage starting at Masterful. So it also only boosts Reflex to Masterful. If the character instead had Masterful in those stats and used the same boost, Strength would not be improved and Reflex would only gain a Minor Advantage. If you have any questions regarding the ways boosting works, please contact a member of Staff to help explain the process. There are four categories of stat boosts that are possible. Boosts granted by Physical Styles such as Gokenryu/Strong Fist, etc. Boosts that are only granted for a specific movement or purpose (for example, the boosts granted by the Body Flicker Technique or Leaf Whirlwind). First are applied boosts granted by Skills or SAs, or those that are explicitly stated to go first. Second are applied continuous, nonpermanent boosts. Third are applied boosts granted from Physical Styles. Fourth are applied boosts for a specific purpose. Five are applied boosts granted by items. This topic is going to contain the information about what canon techniques give what boosts, as well as canon techniques that have been modified to fit optimally into this site. If you feel that a technique should be added then PM a Global Moderator about it. If the Global Moderator has not replied that "The technique has been taken up for discussion" within 48 hours you may PM another Global Moderator. It usually helps to PM those that seem to be online around the time you are to send the PM. Description: A hard body taijutsu style originating from Konoha, the Strong Fist has become a popular school and now sees widespread use. Many of its techniques reference its origin, though some schools may omit or alter the “Leaf” title from their names. It is a brutal and physical style that focuses on solid impacts, the mangling of organs through external force, and the delicious sound of breaking bones. Long and hard hours of both mental and physical dedication are required to use this style, and as such those proficient in its intricacies strike fast, hard, and brutally accurate blows to their opponents. This style grants +1 advantage to Strength, Reflex, and Coordination to strikes while in use for a D-Rank stamina upkeep. Dynamic Entry | Dainamikku Entorī (D-Rank) Grants +1 Advantage to Reflex for the leap and Strength for the impact. Leaf Gale | Konoha Reppū – (D-Rank) Grants +1 advantage to Reflex for the kick. Leaf Whirlwind | Konoha Senpū – (D-Rank) Grants +1 advantage to Reflex for the kicks. Leaf Drop | Konoha Otoshi (D-Rank) Grants +1 advantage to Strength for the heel drop. Double Dynamic Entry | Daburu Dainamikku Entorī – (C-Rank) Uses Dynamic Entry (and its boosts). Requires two users, and if both kicks connect, treat the knockback as if Strength had been granted a full tier boost instead. D-Rank cost each. Leaf Great Whirlwind | Konoha Daisenpū – (C-Rank) Grants +2 advantages to Reflex and +1 advantage to Strength for the kicks. Leaf Rising Wind | Konoha Shōfū (C-Rank) Grants +2 advantages to Strength and +1 advantage to Coordination for the kick. Lion Combo | Shishi Rendan – (C-Rank) Grants +2 advantages to strength for the initial kicks, which increases to a full tier for the final falling kick. Shadow of the Dancing Leaf | Kage Buyō – (C-Rank) Grants +2 advantages to Reflex for the kick and +1 advantage to strength to help launch the target into the air. The user then moves quickly enough to match the velocity of their ascending target, provided the kick was successful. Leaf Coiling Whirlwind | Konoha Tsumuji Senpū (B-Rank) Grants 1 full tier to Reflex and +2 advantages to Strength for the kick. If used in collaboration with an ally and both kicks land, treat inflicted damage as if Strength had been granted a full tier and +1 advantage higher instead. Requires Leaf Strong Whirlwind. Leaf Strong Whirlwind | Konoha Goriki Senpū – (B-Rank) Grants 1 full tier to Reflex and +2 advantages to Strength for the kick. Leaf Great Flash | Konoha Daisenkō – (B-Rank) Grants 1 full tier to Strength and +2 advantages to Reflex for the kick. Leaf Rock-Destroying Rise | Konoha Kaiganshō (B-Rank) Grants 1 full tier and +1 advantage to Strength. Description: A graceful taijutsu style that can be like a flowing river or steadfast like the mountain. The Jūken is intended to be utilized along with the Byakugan kekkei genkai and the Chakra Needle Technique to strike and lock down opponent's tenketsu with well placed displays of pinpoint strikes. Even those who lack the Byakugan can use this style to cause internal damage shoving foreign chakra into the target’s body. This style grants +2 advantages to Coordination and +1 advantage to Reflex to strikes while in use for a D-Rank stamina upkeep. NOTE: Contrary to what the wikia says, the basic Gentle Fist style does not possess the ability to destroy any and all chakra-based substance. Gentle Fist: Tenketsu Needle | Jūken: Tenketsushin – (E-Rank) Used to surgically inject chakra into the opponent to cause internal damage or lock down tenketsu. See the clan page for effects per strike. Eight Trigrams Sixteen Palms | Hakke Jūroku Shō – (D-Rank) Grants +1 advantage to Reflex for the strikes. Can attempt up to 16 strikes. Palm Bottom | Shōtei – (D-Rank) Grants +1 advantage to Reflex for the thrust. Water Needle | Mizu Hari – (D-Rank) Requires Suiton. Eight Trigrams Thirty Two Palms | Hakke Sanjūni Shō – (C-Rank) Grants +2 advantages to Reflex and +1 advantage to Coordination for the strikes. Can attempt up to 32 strikes. Eight Trigrams Sixty Four Palms | Hakke Rokujūyon Shō – (B-Rank) Grants a full tier to Reflex and +2 advantages to Coordination for the strikes. Can attempt up to 64 strikes. Eight Trigrams Empty Wall Palm | Hakke Kūhekishō – (A-Rank) Costs a B-Rank each if used by two collaborating users. Gentle Step Twin Lion Fists | Jūho Sōshiken – (S-Rank) Strikes are treated as if hit by an increased Strength, granting a full tier and +1 advantage to strength. Technique lasts until concentration is broken. Drains a D-Rank per hit, unless used with rapid strikes (16 Palms drains a C-Rank total, 32 Palms drains a B-Rank total, 64 Palms drains an A-Rank total, 128 Palms drains an S-Rank total). Description: A technique requiring fine chakra control and concentration, where the user focuses chakra into their hands or feet and releases it with pinpoint timing when landing a strike. Massively improving the power of the user's taijutsu gives the illusion of greatly enhanced strength. Tsunade created the concept of this technique to intimidate enemies and keep them at bay while she healed injured ninja. Grants a full tier and +1 advantage to Strength with strikes, requiring a B-Rank amount of chakra per hit. Cannot normally be stacked with other styles (make a custom instead). Can benefit from Ijutsu cost reductions but not Taijutsu's (as it uses chakra). Heavenly Foot of Pain | Tsūtenkyaku – (C-Rank) Grants a full tier to Strength for the heel drop. Heaven Spear Kick | Tensōkyaku – (B-Rank) Grants a tier and +1 advantage to Strength for the kick. Cherry Blossom Impact | Ōkashō – (C-Rank) Grants a full tier to Strength for the impact. Full Blossom: Cherry Blossom Impact | Mankai: Ōkashō – (B-Rank) Grants a tier and +1 advantage to Strength for the impact. Puppet: Spring Punishing Strike | Kugutsu: Haruchūgeki – (A-Rank) Grants a tier and +2 advantage to Strength for the impace. Requires assistance from a Kugutsu user using Skillful Achievement with a Human Body, which also grants the user speed in accordance with that technique. Description: This style of combat focuses on simple physical attacks such as palm strikes, shoulder thrusts, knee strikes, and punches often augmented with the user's own incredible strength. Users of this style are known to be able to easily defeat their opponent in a minimal number of hits, sacrificing speed and accuracy of attacks in favor of raw strength capable of wrecking havoc. Grants +2 advantages to Strength with strikes while in use for a D-Rank stamina upkeep. Requires stability on the ground to remain in use. Rising Knee: D-Rank. Strength +2 adv. A strong knee strike in which the user puts his weight behind the blow, often sending the target into the air. Can create an opening for the Tokken. Tackle Charge: D-Rank. Strength +2 adv. Requires to charge for at least 1m. If the user charges for at least 5m ahead of time, Strength gains an additional advantage. A straight shoulder tackle preceded by a slight charge. Crushing Palm: D-Rank. Strength +2 adv. A strong palm strike with the user's weight behind it. This technique has some extreme impact penetration power.? Rising Impact Palm: C-Rank. Strength +1 tier. An extremely strong rising palm strike in which the user makes his/her own body like a spring, uncoiling it to almost full extension just as the strike lands, intended to send an opponent flying. Pressure Palm: C-Rank. Strength +1 tier. Using a combination of ones own strength and the strength of gravity, this downwards directed palm-thrust is strong enough to rupture the ground in a large radius. Boulder Strike: B-Rank. Strength +1 tier +1 adv. A punch in which the whole momentum of the body has been thrown in behind, this technique can easily shatter boulders, pulverize bones, and cause other such nastiness upon a successful hit. Falcon Drop: D-Rank. Strength +2 adv for holding the opponent still. Disturbance Taijutsu: A-Rank. Reflex and Coordination +1 tier. All who view it are treated as having a tier less precog against predicting its attacks. Kumogakure exclusive. Reverse Beheading: C-Rank. Coo +1 adv and Reflxes +2 adv. Crescent Moon Beheading: B-Rank. Reflxes +1 tier. Coo +2 adv. Deception Beheading: D-Rank. Reflex +1 adv. Flame Beheading: B-Rank. Requires Katon and Chakra Flow. Mist Beheading: B-Rank. Distraction gets +1 adv to Reflex for D-Rank each. Falling thrust gets +2 adv to Reflex for C-Rank. Crescent Moon Dance: A-Rank. Reflex, Coo, Str +2 advs. -2 advantages for tracking its movements. Nadeshiko-Style Deep Crimson Dance Performance: C-Rank. Grants Reflex and Coordination +2 advantages for the rapidity of the barrage (and to draw the kunai), but Coordination receives no boost for accuracy. Dance Performance: Second Step: B-Rank. Grants +1 tier and +1 advantage to Reflex for the spin, but 1 tier to Reflex and Coordination for the rapidity of the barrage (and to draw the kunai), but Coordination receives no boost for accuracy. Body Flicker Technique | Shunshin no Jutsu – (D-Rank) Grants a full tier boost to Reflex. Restricted to unidirectional movement for the dash. Afterimage Clone – (C-Rank) Uses the Body Flicker (and its boosts). The effect of this technique is negated if an opponent can effectively track the user. Transparent Escape Technique: B-Rank. This technique renders the user invisible, but it must be activated while unobserved. If the user moves at a higher than Poor speed, it is ineffective and must be recast when the conditions for the technique are met once again. Replacement Technique | Kawarimi no Jutsu - (E-Rank) This is a technique that anyone who has been through the Academy can perform. The technique works by creating an illusionary distraction that the user has replaced themselves with, causing the enemy to target the distraction instead of the user. The technique is prepared ahead of time, and then at some point afterward is activated to replace the user with the distraction object. The user then reveals their true location (which must be somewhere they could reach) and can respond from there. This technique is usable once per topic. This is high-speed movement more akin to the Body Flicker technique than actual teleportation. The effect feels like teleportation because the enemy is distracted during it, and stating where and how you are traveling is not necessary (although one may be asked to clarify if a particular movement seems impossible). Using this technique reactively generally has negative consequences, as it would naturally take longer to set up your distraction and may not have time to do so while a fireball is heading straight at you. While your Substitution is prepared, remember not to use any techniques that would give away your location, such as a lightning bolt erupting from the wrong space. Earth Release: Fist Rock Technique: C-Rank. Strength +1 tier +1 adv. No contact. Rock Armor: B-Rank. Con +1 tier, Strength +2 advs. No upkeep. Doesn't stack with Earth Spear. Earth Release: Whac-a-Mole Technique: B-Rank. Trained to pop out of the ground, strike an enemy, and return to the ground before their target can react, the user is able to whack multiple targets located around the battlefield in quick succession. Grants Reflex +1 tier and +1 advantage. Earth Release: Hardening Technique: B-Rank. Con and Str +1 tier. Con has no effect against Raiton. Reflex reduced by a major advantage. B-Rank cost and C-Rank upkeep. Earth Release: Earth Spear: B-Rank. Con +1 tier. Str +2 adv. Con has no effect against Raiton. B-Rank cost and C-Rank upkeep. Nadeshiko-Style Hardliner Gale Fist: B-Rank. Produces a shockwave, and strikes with the user’s Strength, granting it +1 tier. Nintaijutsu. Nadeshiko-Style Hardliner Revolving Cut: B-Rank. Grants the user +1 tier and +1 adv to Strength for the falling kick. Nintaijutsu. Lightning Release: Lightning Strike Armor: B-Rank. Reflex +1 tier and Coo +2 advs. B-Rank cost and C-Rank upkeep, and requires concentration, lasting until struck. Water Release: Rising Water Slicer: A-Rank. Attack slices through rock and wood regardless of rank. Lava Release Armor: B-Rank. Con +2 Advs. B-Rank cost and C-Rank upkeep. Gives off intense heat, burning like a C-rank technique on contact. Armor of Sand: A-Rank. Constitution +1 tier +2 adv. -2 adv Reflex, increasing to a tier if hit with the sand becomes drenched. A-Rank cost with C-Rank upkeep. Lightning Release Armor: Stage 1: A-Rank. Grants +2 advantages to Strength, and a full tier boost to Reflex and Constitution. A-Rank activation with a C-Rank upkeep. B-Rank Wind can pierce and disable the armor. Lightning Release Armor: Stage 2: S-Rank. Grants a 1 tier boost to Strength, and 1 tier +1 adv to Reflex and Constitution. S-Rank activation with a B-Rank upkeep. A-Rank Wind can pierce and disable the armor. This jutsu's nature is extremely erratic and wild, making it incredibly hard to control properly - this property causes the user's chakra to spike uncontrollably (which opposing Water Release may be capable of taking advantage of) and makes it impossible to perform any Ninjutsu, Genjutsu or Fuuinjutsu above the rank of D, effectively making Taijutsu and Nintaijutsu the only things able to be done smoothly. In addition to this, the user is also unable to use any element other than Lightning since the field of Lightning chakra completely dominates the user's chakra network when used. The chakra covering him actively attempts to dissipate foreign chakra that comes into contact with it, while this may be helpful, it also prevents an ally's jutsu from effecting them - such as medical techniques; that are of lower rank, severely reducing their effectiveness. The user can jumpstart the jutsu into its second stage without having to go through the first, though they would need to have trained the second stage beforehand. Lariat: A-Rank. Strength full tier +2 adv. Double Lariat: A-Rank. Strength full tier +2 adv. Two users. If both hit, +2 Adv. Elbow: C-Rank. Strength +1 tier. Guillotine Drop: B-Rank. Strength +1 tier +1 adv. Liger Bomb: S-Rank. Strength +2 tiers. Lightning Oppression Horizontal: B-Rank. Strength +1 tier. Reflex +2 adv. Lightning Oppression Horizontal Chop: A-Rank. Strength +1 tier +1 adv. Reflex + 1 tier. Lightning Straight: A-Rank. Reflex +1 tier +2 adv. One can make a specific amount of Shadow Clones based on their Stamina by spending 30 points of chakra. This technique can only be enacted by those with at least an Epic Stamina. The 30 points of chakra expended are used to create a number of clones with an additional pool of chakra to share. These clones are identical to the user and have clones of their equipment (though special equipment does not have its unique abilities cloned). They do not gain additional chakra points for the user's Skills, should that be available to the user. Clones created in this fashion do not need to pay an activation cost for techniques already active on the original when they are created, though they must pay upkeep. For the Tajū Mokubunshin (Multiple Wood Clones Technique) it is the same system, though note - there must be an appropriate amount of foliage available to actually create the clones. To know Tajū Mokubunshin one must know Tajū Kagebunshin as well as the Mokubunshin techniques. This technique costs an S-Rank amount to initiate, and an upkeep of B-Rank per round afterward, to a maximum of 3 rounds per activation. Kirisame causes external chakra manifestations of a different signature than the user's to dissipate into the environment. What does this mean? Well, here's a short list of some of its effects on certain types of techniques. Elemental Ninjutsu: Cannot be created in Kirisame, nor manipulated. Existing elements formerly created by chakra are unaffected. E.g. A standing Earth-Style Wall, water left behind by a Suiton, etc. Assuming chakra is not maintaining its form. Clones: Cannot be created in Kirisame. Existing solid clones are not affected or destroyed by the rain. Bijuu Cloaks/LRA/etc: These are affected by Kirisame, but due to the constant outflow of chakra, their boosts stay in effect, albeit at half the usual numbers. Chakra Flow Weapons: Counts as external. Rendered useless by Kirisame. Summoning: The instantaneous summoning of creatures is unaffected. Fuuinjutsu: Somewhat of a case by case basis. Seals in place will not just unravel, though activating their effects may not work. If its raw external chakra, it's dissipated. If two Kirisame are used in direct opposition, their effects will cancel each other's out. However, a Kirisame cannot be activated when already within the rain+mist of another Kirisame, as it falls under the category of Elemental Ninjutsu: "cannot be created in Kirisame." This technique advances as the user learns to open the Eight Inner Gates, starting with the first. The first of these Gates allows a 1 tier increase (maximum Epic) to Strength, Reflex, and Constitution. The second Gate allows this technique to immediately refresh 50% of the user’s spent Stamina, but no other statistical increase. The third Gate allows the user to regenerate from a wound due to the increased blood flow and chakra release (does not need to be immediately used upon entering this gate, but can only be used one time per activation). The fourth Gate allows the user to increase their stats again, by another tier (maximum Legendary). The fifth Gate allows an additional 50% refresh to spent stamina, with no additional statistical increase. The sixth Gate allows the user to exert their Strength in a 10 meter radius as constant “pressure”, making it difficult to stand or move – this actually reflects in a negative to opponents’ within this range Reflex and Coordination equal to the difference between the user and the opponents’ Strength*. The seventh Gate allows previous statistical limits (Legendary) to be surpassed and now go to Godlike – in addition, another 1 tier increase to Reflex, Strength, and Constitution are allowed, and the “pressure” range increases to 20 meters. In the Eighth Gate, all limits are surpassed – even that of Godlike (though not beyond 1 tier past it), and an additional 1 tier increase to Reflex, Strength, and Constitution. The technique can be active with as little or as many Gates as the user knows. However, the technique cannot go backward in power without deactivating completely – once one advances into the Eight Gates Mode, there is no turning back. Drawbacks - This kind of power doesn’t come without its drawbacks. No matter which gate is open, they may only be open for as long as one has advantages in Constitution. In addition, a minor disadvantage to each physical stat the Gates govern per gate opened (up to 7, or 2 tiers + 1 minor disadvantage) is incurred for as long as the gates were open. If open for more than five rounds, this damage is permanent and must be retrained at half the original value. If a stat is increased to Legendary or Godlike via this technique, the damage to that stat is permanent no matter how long the technique was active.Taijutsu Specialists take only half this permanent damage (though suffer the same temporary damage). If a character with the Expert rank or higher in the Ijutsu Skill assists in the recovery, it may be retrained at quarter the original CP value. The penalty for the Eighth Gate is death, of course. As a special note, a Taijutsu Specialist can halve these experience values. *For example, if the user's Strength is Masterful, and the target's Strength is Average, a two-tier penalty is applied to the opponent's Reflex and Coordination. This can be mitigated through Strength-boosting techniques on the part of the opponent at any time, so long as it increases all aspects of strength. Body Revival Technique: Stage 1: S-Rank. Grants regenerative capabilities similar to Yin Healing Wound Destruction, and can be used to fake a dead or catatonic state. S-Rank activation with a A-Rank upkeep. Body Revival Technique: Stage 2: S-Rank. Grants a 2-advantage boost to the user's Strength, Constitution, and Reflex, as well as the regenerative capabilities of the first stage. S-Rank activation with a S-Rank upkeep. The user appears to become much more well-muscled, which may give a bulky look. If the user is particularly old, their hair might regain any lost colour and grow (if they were balding). As with LRA, the user can jump-start the technique into its second stage without having to go through the first, though they would need to have trained the second stage beforehand. Contrary to claims made by the technique's user in the Bonds movie, this technique does not negate or reduce the penalties of the Gates' activation (though it may be used to compensate for the Gates' aftereffects). S-rank Activation - Costs little to no chakra to keep up. This technique detects chakra up to 12km with anything beyond 10 km being increasingly fuzzy and diffuse and as such harder to locate or measure. This manifests in game mechanic as a way to detect chakra signatures in the same land subforum (for example, if one were in Shumatsu, they could detect a chakra signature in a different topic in Shumatsu, but not in Central Hi no Kuni or Tanzan - as always this is subject to staff approval). If focused upon a single person, it can easily detect when someone might be lying (though not the nature of the lie, nor the truth) via fluctuations in their chakra, and per usual detect if themselves or another is in a Genjutsu. If the same focus is given in a combat situation, the technique provides a one tier increase in Wisdom for the purposes of precognition, but only against that single target. While this bonus is in effect, their sensory range also becomes the norm for their Sensory FS level, rather than the previously mentioned 12 km. During this technique, all chakra signatures within their normal Sensory FS range can be tracked by amount (percentage of chakra remaining and their current Stamina stat). While not completely unavailable for use, these techniques cannot be learned by any conventional means. Staff must grant any character the ability to train these. These techniques are Monk and Samurai exclusive, and can be learned as a regular jutsu by anyone of the corresponding origin. Samurai have access to the following origin-exclusive techniques listed on the Naruto wikipedia: Samurai Sabre Technique, Flash, Rupture, Dancing Blade Risk, and Chakra Shockwave Slash. Handsigns: Requires a sheathed blade. Lore/Flavor: Known as the Art of the Quickdraw, mastery of this technique is said to be available only to those who have practiced the art a thousand times. Those who master this technique are said to rival Mifune’s Iai Beheading. It is the art of drawing your sword, striking with it, and immediately resheathing your blade. Description: The art of Iaido is the pinnacle of a samurai’s excellence. It is used to counter the ninjutsu of a shinobi, in the sense that a quick Iaido strike is able to interrupt ninjutsu. Within close range, a samurai may make an Iaido strike against an opponent. If that opponent has Coordination less than or equal to the samurai’s, any handsigns they make are interrupted. Each Iaido strike is finished by resheathing the blade after the strike is made. During use, Iaido gives a one-tier and a minor advantage boost to Coordination. At Epic, this boost is reduced to a full tier. At Legendary, this boost is reduced to a major advantage. Drawbacks: Each Iaido strike requires the blade to be sheathed, meaning you cannot have a drawn blade to use it, and it is required to be sheathed after the strike, meaning your blade is not drawn for immediate self-defense after the strike. A non-samurai learning this technique must pay a 100 CP fee, which does not count towards your ACP. Lore/Flavor: Known as the Projection of the Self, this technique was developed to strike true at any opponent's weaknesses, regardless of their durability. Description: The art of Sohei is the offensive pinnacle of a monk’s training. It is a strike that sends a shockwave forward from the hand, up to twenty meters in distance, making it effective when striking someone directly, or attacking them at a distance. Attacks from Sohei lower the target's Con by a tier for the purposes of taking that particular hit. Sohei grants a one-tier and minor advantage bonus to strength for a single strike. At Epic, this boost is reduced to a full tier. At Legendary, this boost is reduced to a major advantage. A non-monk learning this technique must pay a 100 CP fee, which does not count towards your ACP. Handsigns: The user takes a monk stance, with their left hand making a semi-ram handsign, and with the right hand facing down with the palm parallel to the ground. Lore/Flavor: Projecting their spirit outwards, which assumes the shape of a Kannon, or "Mercy Goddess", the Senjusatsu is one of the most icononic Buddhist techniques. The Kannon generally has a calm and tranquil golden visage, but when the user's emotions are distorted by something such as anger, its appearance can change. When angry, the Kannon can appear as a red-faced oni, when scared, it can appear as a purple-colored yokai, et cetera. Description: The technique creates a floating, many-armed spirit Kannon behind the user. The statue remains stationary behind the user, who must also remain mostly stationary while using this technique. The technique creates a five-meter radius around the user, from which the Kannon can attack. The user is able to move within this radius, but must constantly hold their hands in the proper stance. The Kannon is able to materialize its fists to attack targets within the five-meter radius. Shortly after appearing and attacking the target, the hands disappear. The Kannon, as a projection of one's own spirit, is able to preform a certain amount of punches and strikes per post. This number is based on the user's Wisdom (via deep understanding of the spirit), or Reflex (through physical training). At Poor, the statue can make two attacks per post. At each tier beyond that, the number of strikes doubles. This means four strikes at Average, all the way to one hundred and twenty-eight strikes at Godlike. These strikes are preformed at the user's Strength (modified by any continuous but non-permanent boosts, but not by other boosts), with an A-rank boost provided by the technique itself. This translates to a four advantage boost to Strength, reduced to a three advantage boost to Strength after Legendary. Drawbacks: While the Kannon itself is not physical, but spiritual and ethereal, the Kannon's materialized fists are physical and can be blocked and interacted with. If the user is forced to move out of the Kannon's area of effect, or if the user's stance is broken, the technique immediately ends. That means, for the technique to function, the user must remain completely stable within the area of effect. The Kannon is also only able to materialize its fists within five meters of the user, meaning that long-ranged attacks can prove very effective when this technique is maintained; as the user cannot move without breaking the technique, and yet cannot attack them from so great a distance away. Note: Below is the default system for curse seals based off of Orochimaru's Juuinjutsu. Custom curse seals may use their own drawbacks, training. But the progression remains the same. Which stats are raised and by how much are determined by the recipient when applied. Once chosen, they cannot be changed. Applying a Cursed Seal: Once you've studied the DNA and developed your Juuinjutsus or trained some old ones, you implant these seals into your victims/subjects. This requires PCs to be captured or volunteered for experimentation. After implanting them with the seals, and studying its affect on the PC, you gain +25% on the success rate of the seals, until you reach 100 in all the ranks. The starting success of the ranks is as follows: D-Rank: 75%, C-Rank: 50%, B-Rank: 25%, A-Rank: 0%, S-Rank: -25%. Once the patient has received the curse seal, a BoD will roll a 100 die to determine the outcome of the Curse Seal. Honestly, these won't work every time, so be prepared for the worst result when taking the risk. A 100-sided die will be rolled, with the result indicating success or fail with the implementation of the curse seal(Ex: If you have a 25% chance of success, 1-75 will result in failure, 76-100 will result in success). A natural 1 is always a failure, regardless of success chance. If you obtain a natural 100 then you are automatically bumped to Level 2 of Stage 1 as a result of flawless implementation. "Well, what happens if it fails? Do I just automatically die?" 1: Death! The seal has not responded well within the body, and as a result has killed the receiver completely. 2-3: The curse seal failed, but you're not dead. This comes at a severe cost though, the receiver has completely and permanently lost their bloodline (if they have one). 7-10: The seal is effectively a failure. The receiver will never be able to advance to the 2nd stage of the Curse Seal, and when using it will exhibit a 50% chance of the seal taking control(Speak to Staff about rolling to determine when this occurs). The seal, while it may grant you a bit of power, is literally eating away at the body. Your immune system is barely able to stand it, and over time it will severely weaken you and when used more than 5 times in your lifespan, will kill you. Level 1: Starting Level. Grants recovery of a minor advantage in stamina during use(see drawbacks for explanation of "recovery"). May use for up to 3 posts. User paralyzed for 3 posts after usage, followed by a 2 post period of a major disadvantage in stamina. Level 2: Requires 750 CP to have been gained since the acquisition of the cursed seal (keep track of this number alongside your ACP, UCP, and TCP totals while doing updates). Grants half of the tiers in the maximum amount of the Curse Mark's rank as well as a recovery of a major advantage in stamina during use. May use for up to five posts. User is paralyzed for 1 post after usage, followed by a major disadvantage in stamina for 4 posts. Level 3: Requires 1500 CP to have been gained since the acquisition of the cursed seal. Grants the full tiers for the Curse Mark's rank, and during use the user recovers the full tier of stamina. May use for up to 10 posts at a time. Paralysis effect negated. Major Disadvantage in stamina for 5 posts after use. To reach Stage 2, one must actively spend 500 UCP into the seal to allow for its evolution. This CP does count towards your ACP! The user must also spend a post or two explaining the evolution of the seal to its next stage. Level 1: Obtained upon spending the 500 CP mentioned above. Grants Full stat raises + additional ability (this could be things like flight/jutsu enhancement/etc. ), as well as a minor advantage in all physical stats. May use for up to 3 posts. Followed by a 5 post penalty of a tier debuff in stamina and constitution. Level 2: Requires 2500 CP to have been gained since the acquisition of the cursed seal. Grants full stat raises + additional ability, as well as a major advantage in all physical stats. May use for up to seven posts. For ten posts after the seal was used: a tier debuff in stamina and a major disadvantage in constitution is applied. Level 3: Requires 3500 CP to have been gained since the acquisition of the cursed seal. Grants full stat raises + additional ability, as well as a major advantage in all physical stats. The user can now utilize instant stat raises to specific portions of the body. Stage 2 may now be used for ten posts maximum. For five posts after usage: Major disadvantage in stamina and constitution. Available only to Perfect Seals (A rank and higher). Drawbacks of a Cursed Seal: A base stamina of at least Proficient is required to be able to access a cursed seal's power. Upon acquisition, a full tier of your stamina is stored in the seal. You still technically have that full tier in stamina, but it is stored away in the seal instead of your chakra supply, and can only be "recovered" during the Cursed Seals usage(for example, if you had Masterful Stamina normally, you would calculate your chakra usage while not using the curse seal as if you only had Proficient Stamina). Usage of a typical Cursed seal influences the user's personality, causing them to grow darker and more cruel. This is something we expect to see in the portrayal of the character. Also, it causes you to feel drawn to the person who sealed it into you. A connection is formed in which you can be more easily manipulated by the sealer(this is represented by a tier penalty in wisdom when around that sealer in terms of handling manipulation). Other drawbacks are listed alongside training and application above. Finally, the Cursed Mark will force itself to activate when your stamina drops to less than 25%, in which the drawbacks may perhaps kick in at the worst time(unless you spend 1 Will point in that topic to force the mark to recede). Unsealing opposing Seals is based on a mixture of your aptitude with Fuinjutsu and your level of Wisdom. The higher your proficiency in Fuinjutsu (Novice, Adept, Expert, Specialist, etc) the better at unsealing you will be. When dealing with seals created by someone who is less adept than you are, you may always immediately succeed in unsealing their Fuinjutsu. A Specialist can always unseal the seal of an Expert, likewise an Expert can always unseal the seal of an Adept, etc. Should the level of Fuinjutsu between Unsealer and Sealer be equal however, the Unsealer will succeed if they have higher Wisdom. Should the Unsealer's Wisdom prove to be lower however, they may not immediately Unseal the opposing Seal. This does not mean the Seal is invulnerable however. Every 72 hours spent studying a Seal garners a Tier Advantage to Wisdom for Unsealing that particular Seal, up to a Two-Tier Advantage. Should this still not be enough to break the Seal, numbers can also help out. For each Fuin Adept that helps you break a seal, add a Minor Advantage to Wisdom. For each Expert, add a Major Advantage, and for each Specialist or above, add a Tier. Seals created in specific relation with other seals receive a Wisdom bonus for Unsealing a Seal of that type. For example, using Five Element Unseal against a Five Element Seal will provide an additional Tier bonus to Wisdom for Unsealing. Sage Mode is an empowered state unique to those few shinobi who have mastered the ability to combine their own spiritual and physical energies with natural energy (自然エネルギー, shizen enerugī) to create senjutsu chakra (仙術チャクラ, senjutsu chakura). Though not all those who are able to mould senjutsu chakra are able to enter Sage Mode, those who can find themselves able to greatly extend the reach of their own physical abilities, with augmented reserves of stamina, and access to senjutsu (仙術, lit. sage techniques). The instruction of the various processes involved with the actual training of Sage Mode is usually performed by one of a limited number of summons from an even-more limited number of contracts. Notable among these are the Slug, Snake, and Toad contracts, whose schools of senjutsu are the most well-renowned. The process of moulding senjutsu chakra is difficult to master. Once attuned to natural energy (a practice which, on its own, can be difficult to master), the user will learn to gather it, blending it with their chakra. Should the user mould too little natural energy, any chakra they mould will be ineffective for any purpose. Conversely, if too much natural energy is taken in during the process, the user’s body will petrify, taking the shape of the summon from whose school of teaching they are instructed. Those who master the process of the creation of senjutsu chakra, who are able to enter Sage Mode, are called sages (仙人, sennin). Mechanically, the process of training through the various stages of control over senjutsu chakra and Sage Mode is represented by the expenditure of CP. CP that is spent to advance through the stages of Sage Mode does not count towards a character’s ACP. Each stage of mastery over senjutsu chakra and Sage Mode grants a certain number of Senjutsu Points (or "SP", not to be confused with Stamina Points), which function similarly for users of Sage Mode as they do for those with the Nature Clan Kekkei Genkai. For those with access to Incomplete Sage Mode or a higher stage of Sage Mode, each turn spent with Sage Mode active will drain from the user’s available pool of SP. SP can be spent to pay for techniques, as if they were Stamina Points (however, they do not have to be spent exclusively; e.g. a character may spend 7 Senjutsu Points and 8 Stamina Points to pay for a technique that costs 15 Stamina Points). Consequently, spending from their pool of SP will shorten the amount of time that a character can remain in Sage Mode. Each stage of training will also have an associated rate at which the user’s pool of SP is refilled. Through the use of certain techniques, a sage may have others perform the meditation necessary for using Sage Mode in place of themselves. 200 CP - This stage of the process of training Sage Mode will, for most individuals, just be a stepping stone to higher levels of development. It grants nothing aside from access to the ability to mould senjutsu chakra, and a small pool of 20 SP. It is at this stage that user may realize that their physical condition is insufficient to progress beyond their current ability to mould senjutsu chakra. Those with Poor Constitution, who are undergoing the rejection process for certain techniques, and those who have undergone the rejection of implanted organs find themselves unable to enter Sage Mode, and thus unable to progress further. Additionally, progress further, the user must possess at least Epic Stamina, as those with any less are unable to properly balance natural energy with their own chakra. 400 CP - This, the first stage of Sage Mode proper, is not fully-developed. Occasionally called Honored Sage Mode (発動仙人モード, Hatsudō Sennin Mōdo), the first stage of Sage Mode’s development involves an imbalanced combination of natural energy with the user's physical and spiritual energies. This results in an appearance that is warped in a primal manner, causing the user to take on features of the summon from whose school of teaching they have learned. Incomplete Sage Mode grants a pool of 40 SP, with the upkeep for Sage Mode being 5 SP per post. Each post of stationary meditation grants 5 SP. At this level and all additional levels, sages are able to sense up to six different chakra signatures at a given time within a two-hundred meter range, and are capable of sensing the amount, fluctuation, and intent of chakra. Users may enter Sage Mode after three posts of meditation. 600 CP - The stage of Sage Mode that allows the user to achieve the effects that Sage Mode is most well-known for. Their appearance is no longer warped as it is in the previous stage, except for their eyes, which alter based on the method by which the user achieved Sage Mode, generally which animal contract they are attuned to. Complete Sage Mode grants a pool of 80 SP, with the upkeep for Sage Mode being 10 SP per post. Each post of stationary meditation grants 10 SP. One who has perfected Complete Sage Mode may enter Incomplete Sage Mode while retaining Complete Sage Mode’s 80 SP pool. For every 100 CP gained by the user while they have Complete Sage Mode unlocked, they receive an additional 10 SP to their pool, to a maximum total of 120 SP. Users may enter Sage Mode after two posts of meditation, or after one post of meditation but with half of their SP pool available. 800 CP - The stage of Sage Mode that allows the user to achieve what we have rarely seen; Perfected Sage Mode is rare, even among sages. Expanding on the optical changes of Complete Sage Mode, the eyes of of a sage who has mastered the Perfected Sage Mode gain additional features, generally some kind of tattooing around the eyes, such as orange pigmentation or curving tattoo patterns. Perfected Sage Mode grants 160 SP, with an upkeep for the Sage Mode of 20 SP per post. Each post of stationary meditation grants 20 SP. One who has mastered the Perfected Sage Mode may enter the Completed Sage Mode or Incomplete Sage Mode while retaining the Perfected Sage Mode's 160 SP pool. For every 100 CP gained by the user while they have Perfected Sage Mode unlocked, they receive an additional 10 SP to their pool, to a maximum total of 200 SP. Users may enter Sage Mode after one post of meditation, or instantly with half their SP pool available. Almighty Push & Pull - The ability to manipulate attractive and repulsive forces manifest as Bansho Ten'in and Shinra Tensei. They allow the user to push and to pull specific objects, or to send out broad waves of energy. These abilities can be used at different magnitudes of strength, from C-rank to S-rank, and the two abilities share a synchronized cooldown period. At C-rank the user can repel or attract equivalent to Masterful Strength, at B-rank they can repel or attract equivalent to Epic Strength, at A-rank they can do this at Legendary, and at S-rank, Godlike. The cooldown is one post at C-rank, two posts at B-rank, three posts at A-rank, and four posts at S-rank. Using either ability with Might Points to increase its strength scales the cooldown to a topic, or thirty minutes, whichever is deemed more appropriate. Alternatively, the user may expend a Might Point to use one of the default Push/Pull abilities outside of its cooldown. Planetary Devastation - A pure core of gravity, strong enough to create satellites and imprison bijuu, Chibaku Tensei is capable of havoc like no other. For an S-rank amount of Stamina, the user is able to decimate a battlefield, ripping up the ground and turning it into a great sphere in the sky, capable of imprisoning even bijuu. This sphere has a Durability of 50, and when used with Might Points, not only is its range increased, but its Durability increases to 100, and the satellite created will become a fully-fledged moon. Heavenly Obstacle Quaking Star - The power of a meteor, utter and complete destruction of a battlefield. With the need for three handseals to be completed simultaneously, this technique requires the power of Susano'o to be properly utilized, and with a 30 Stamina Point cost, there is little rivaling this technique in sheer power. Heavenly Obstacle Quaking Star has 75 Durability, and threatens to completely annihilate a battlefield, and likely the user along with it. Using this technique with Might Points causes an additional meteor to drop after the first. The Animal Path - Needing no blood sacrifice and no hand-seals to summon, the creatures granted by the Animal Path have a myriad of abilities. The user gains access to the eight different animals summoned by the Animal Path, and the user is capable of seeing through the eyes of their summons. Blocking Technique Absorption Seal - This powerful ability grants the user to absorb chakra. Whether in the form of ninjutsu techniques, which can be absorbed up to A-rank in power and grant the Rinnegan user that much chakra, or at the rate of a B-rank amount of chakra drained from the target on extended contact, this is an ability to be feared. When used with a Might Point, this ability can even absorb S-rank techniques. Asura Path - Said to be the mastery of the ninja art of Puppetry, the Asura Path grants the user the ability to alter their body at will with various armaments, traps, and utility functions. This can range from missiles (cost scaling with explosive power, dealing Durability Damage equal to the amount of chakra invested), and bladed weapons (D-rank cost), to propulsion thrusters and extra limbs (B-rank cost). Demonic Statue Chains - One of the most potent fuuinjutsu techniques, the Rinnegan user is capable of extending spectral chains from the palms of their hands, capable of sealing objects inside of a chosen medium at an A-rank cost. Incapacitated living things can be sealed into a chosen medium at an S-rank cost. The chains can be manipulated in order to attack and attempt to bind an individual for a B-rank amount of chakra, and their strength when binding an individual is equivalent to Legendary. 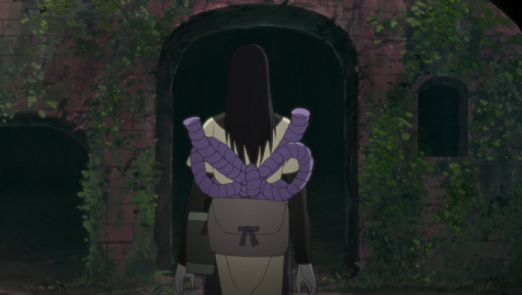 These chains contain a Cursed Seal that suppresses the power of bijuu, making it the perfect technique for sealing a Tailed Beast. Demonic Statue of the Outer Path - A great construct comprising the husk of the Ten Tails itself. This statue can be summoned for an S-rank cost, and maintained for two posts, plus an additional two posts for every tier of Stamina the user has beyond Proficient. It has a Strength of Godlike, a Reflex of Legendary, and a Coordination of Epic. It has no Stamina or Wisdom. The statue has a Constitution of Legendary, but despite any damage it may suffer, it regenerates while not summoned, as long as some of it remains. The Demonic Statue is capable of serving as a receptacle for sealing techniques, and is the only known object capable of storing all nine Tailed Beasts at the same time. Samsara of Heavenly Life - Mastery over life and death, with a price. This technique allows for the user to revive any recently-deceased characters of their choice in the country subforum in which the user preforms this technique. Shortly after the technique is preformed, the user will perish, having exchanged their own life for many others. Black Receivers - At a C-rank cost the user is able to create chakra receivers from their body. These receivers can be created at sizes roughly equivalent to that of a sword or shorter. They are treated as journeyman quality items, and disappear at the time of the creator's death. These items are capable of transmitting chakra over long distances, and if inserted into an enemy, lowers that enemy's Stamina by a full Tier. If the target's Stamina would be lowered below Poor by this, they are rendered paralyzed by the Rinnegan user's chakra. Heavenly Hand Power - A powerful space-time technique birthed from the Rinne Sharingan, Amenotejikara allows for the user to teleport short distances and to exchange the positions of objects or people. For a B-rank amount of chakra they are capable of teleporting up to 20 meters away. For an A-rank amount of chakra, they are able to switch the positions of two objects within a 60 meter distance of the user. A person can be substituted in place of one or both objects, but if a person other than the user is involved with the use of Heavenly Hand Power, the cost is increased to an S-rank. For a Might Point, the user is able to double the distance at which they can teleport or swap objects and people.